Are you a senior executive responsible for multi-million dollar sales contract negotiations? Are you plagued by the fear of getting an unfavorable deal for your company? Is the thought of losing a deal to your competition constantly gnawing at you? Do you often feel powerless to overcome constraints coming from within your own company? If this strikes a chord with you, you’re not alone. Contrary to popular opinion, many large sales contracts are lost because of something known as “internal myopia”. External factors, though critical to the deal, can often be overshadowed by senior management getting hung up on what’s best for them. Their inability to truly understand the client’s point of view, failure to have the right people engaged and their “all you know is what you know” mentality, often results in millions in lost business. 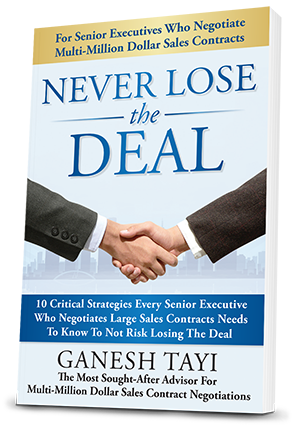 Ganesh reveals 10 critical strategies senior executives responsible for large sales contracts need to know to not risk losing their next deal. He points out how getting caught up in your company’s own agenda could cause you to lose perspective and, quite possibly, the deal itself. If you are a major stakeholder in multimillion-dollar sales contract negotiations and you don’t have a 360-degree view of the deal, you are at risk for getting an unfavorable deal for your company. You may even be at risk for losing the deal to your nearest competitor. I have personally worked on deals on all spectrum of complexity, to one of my largest being worth over $2.5 billion. Through all of those years and lessons, I have developed a passion to give back to the business world the insights I have learned and the issues I have identified that must be overcome to ensure you never lose a deal again. The critical strategies I provide in this book are based on my own experience negotiating deals and from years of studying sales executives at the top of their game. I have seen many deals collapse because the sales executive negotiating the deal felt trapped between the client and their own company’s internal expectations. Get ready, because in this book I will show you how to create a robust business model so you can negotiate every deal briskly, with no bottlenecks. Ganesh Tayi is the most sought-after advisor for multi-million dollar sales contract negotiations. For more than a decade, he has been personally involved with deals of all levels of depth and difficulty. Having worked with major organizations with large-scale contracts that were their “bread and butter”, Ganesh has seen deals that were successful with the highest margins and market share, as well as deals that were lost due to factors that senior executives had trouble grappling with. 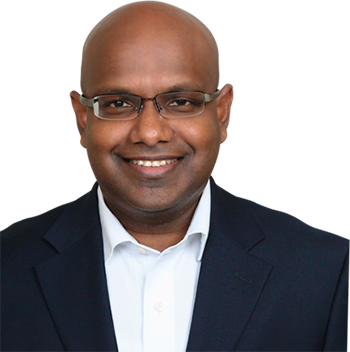 Today, Ganesh works with sales executives and organizations who feel the intense pressures of sales contract negotiations in today’s challenging economic climate. He offers them a fresh perspective and field-worthy practices on how to successfully navigate through turbulent waters. Let Ganesh guide you toward successful sales contract negotiations and ensure that you never lose the deal again. Grab your FREE copy TODAY!